The strategy has long been a point of dispute between us. When taking long overseas flights, some of my friends prefer to spend a good part of their funds on a Business Class ticket, and opt for a cheaper hotel at their destination. They feel they arrive fresher, devoid of jet lag and are immediately able to enjoy their holiday. As I can snooze, even in cramped conditions, I favour Economy Class air, using the savings to pamper myself with a good hostelry. Where I choose to stay doesn't have to exude ostentatious glamour, dripping with chandeliers, endowed with plush surrounds, or display a plethora of liveried staff. Cleanliness, quality bedding, hot water, good service and an appetising breakfast are the baseline. And, I like to stay in hotels, which make me comfortable, feel at home, and are close to the city (or town) centre. It's an approach I never regret when visiting Vienna. From the outside, The "Hotel Astoria," despite its four star rating, appears a most unpretentious establishment. The main entrance could almost be missed amongst the shops and eateries in Fuhrichgrasse, a narrow side street off Kartner Strasse. When we first arrived by taxi from Vienna's Westbhanhof Station, we thought the driver had made a mistake, until the hotel porter emerged to take our bags. Once through the main door, the foyer is homely, the surrounds reserved, and the reception by staff genuine and welcoming. When it was first built in 1912 in the "fin du siecle" style, the Astoria was considered to be the most fashionable hotel in the city. All 125 rooms boasted central heating, telephones, running water, even electronic air conditioning! Twenty-seven suites contained their own bathrooms – something of a sensation in the early part of the twentieth century. For the next thirty years the hotel became the haunt of diplomats, politicians, opera singers, and film stars, but the Second World War saw it occupied firstly by the Russians, and later by the Royal Air Force. While two subsequent renovations have been undertaken (the second completed in 2003), the Astoria has been remodeled in the style of the early 1900s, retaining its historical charm, and original ambiance including the traditional two bedroom door system. As Astoria Marketing Manager, Monica Clavijo, explained, "The double doors were originally for privacy, to stop people in the corridor outside hearing what guests in the bedroom were saying. The space between the doors is also an area where guests can leave their umbrellas and not have to take them into the bedroom." Monica thought the system to be uniquely Austrian. Our generously proportioned room had a King sized bed with electric blanket, an enormous fluffy duvet and super large pillows for back support when reading in bed. And yes, it is possible to read in bed as the lights are so positioned to illuminate the book rather than the ceiling or floor. Though endowed with period furniture, all the mod cons are present - writing desk, cable television, minibar, safe, air-conditioning, not to mention a well-appointed gold and white en-suite bathroom with large bath. 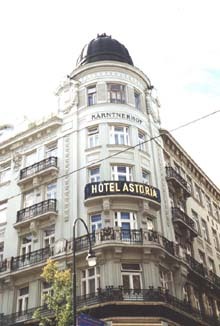 The Hotel Astoria is excellently placed in the "Inner Ring," the very heart of the city, on Kartner Strasse, one of Vienna's foremost shopping streets. St Stephan's Cathedral, the Imperial Palace in all its Baroque glory, the City Hall, the Spanish Riding School, the Vienna Tourist Office, the underground, and the State Opera House are all adjacent. It is the proximity the Opera which has made the Astoria a favourite, not only with music lovers, but also with the artists. "Domingo, Carreras and Pavarotti have all stayed here," Monica reminds me. "They often attend meetings of their fans and enjoy cakes and coffee with them." Breakfasts in the Hotel Astoria are lavish, but relaxed, affairs. "It's one of our specialities," says Monica. An array of fresh fruit and juices, cereals, cold meats, cheeses and cooked fare are on offer on a smogsboard basis, but I preferred to start the day with some of the many delicious Austrian breads, topped with butter and conserve, and washed down with some fine aromatic freshly ground coffee. The Hotel Astoria combines tradition, historical charm, Austrian hospitality, and Viennese coziness, with great meals, well appointed rooms, and an inner city location. But for me, its greatest assets are the friendliness and service provided by staff, some of whom have worked at the hotel for over a quarter of a century. We found both porters and receptionists fonts of information on current attractions, where to get the best prices, times of performances, where to eat, all manner of travel schedules, and general advice about the city. No request seemed too much trouble, and all were treated with competence and courtesy. Comfortable surroundings, good food and exemplary attention — who could ask for more?